The quarry in Barre, Vermont. I am in the process of choosing a memorial stone for my mother's grave. She died on March 3, 2009 and it is time for me to do this next step. In many ways, learning about granite, and planning this memorial stone has been very comforting to me in the past week. I haven't been planning this for a long time, but it just came to me that it was now time to do something about this. I have found what I want, and I am very happy. If that sounds maudlin, I'm sorry, but creating something that is meant to last forever has its happy moments. I am going to order a memorial stone from a company called Rock of Ages, which is a big public corporation that is known for quality, durability, history and reputation. 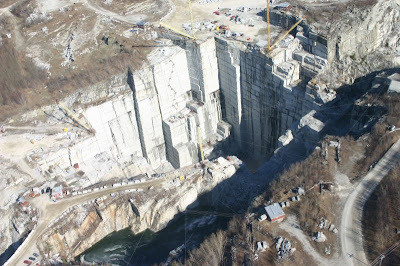 I have searched the web, and learned about granite and quarries and it is all really interesting! Several years ago, I visited the Barre, Vermont quarry that is owned by Rock of Ages, where the granite is quarried. You can take tours, and there are huge beautiful cemeteries nearby where the Italian rock cutters from a hundred years ago practiced their craft on beautiful mausoleums and memorial stones in fantastic array. It is an incredible place. Next month, George and I are going to travel to Barre again, to see the quarry and take a tour and visit the cemeteries again for a weekend. It really truly is a beautiful part of the country...Vermont. There are many varieties of granite, from very interesting places, and there are different grades, colors, etc., but the granite from Barre, Vermont, which is called Barre Gray, is one of the finest. Here is what they say about it on their website: "Recognized around the world as the finest quality gray granite available, Barre Gray is the ultimate long-lasting choice in any finish. Its unique proportions of quartz and feldspar make it unusually durable, moisture resistant and thermally stable." I am choosing this stone for my mother's marker because it is the finest available. To me, it is not the size in this matter, but the quality that is most comforting. Many years ago, I spent a lot of time with two of my aunts, my mother's sisters, of which there were six. (My mother died at the age of 99 and was the last survivor of her nine brothers and sisters.) They were very interested in the graves of their husbands, and their family, and spent lots of time each month taking flowers to the graves to celebrate holidays, anniversaries, birthdays, etc. I am not able to go to my mother's grave often because I live so far away, but the least I can do is spend some time designing and purchasing the best memorial marker of it's type. I have chosen Barre Gray, which is a beautiful medium gray stone. I am going to have this engraved with irises, in memory of my mother's love of her iris garden. She loved her irises and had many kinds and varieties of color and was never happier than we they were all in bloom and she could show them off to her friends and spend time admiring, weeding and dividing them for the next year. I have talked to the only Rock of Ages dealer in Oklahoma, whose office happens to be across the street from the cemetery where my mother is buried, and he is helping me design and create the memorial with a two dimensional carving of irises. This memorial will be finished in September and George and I plan to take a trip to El Reno to be there to take pictures to share with faraway family. We will invite mother's friends and family who are still there to lunch to celebrate her long life. If you had talked to me several years ago, I would never have dreamed that the process of choosing a grave marker could be a happy one, or that I would enjoy learning about granite and thinking of color and design of a memorial. Hopefully, it isn't often that we are required to think of buying a memorial, but I've decided to enjoy this process, and to look forward to seeing a beautiful and meaningful memorial stone on my mother's grave. We have had very cool and damp weather all summer. Here it is almost the end of July, and it is 60 degrees and cloudy outside. We put an air conditioner in the bedroom window, but we only really needed it one night. I looked at the shelves of summer things at Rite-Aid tonight as I was walking through. Shelves of sand pails and shovels, hats, flipflops, picnic containers and plastic cups. They looked so forlorn. I'm sure no one is buying and there is going to be a lot of summer inventory left at the end of the season. Kids are already thinking about going to school. Many vacations were rained out, and when people wanted to be baking in the sun on the beach, they were huddled in sweatshirts at the crab shacks. Oh well. Weather is a funny thing. You can't change it. I need to visit Oklahoma soon, and it has been 100 degrees there, with bright sun almost every day. Everwhere else in the country has been rainy. Oklahoma is the center and all the bad weather is circling around. 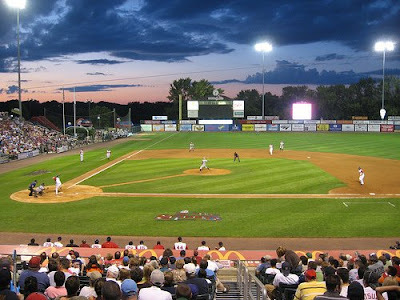 George and I are going to defy the rain and go to the Lowell Spinners Triple A farm team baseball game on Friday night. It is fun to go to Lowell and sit on the bleachers and look out at the green field and the dark night sky. We used to be able to buy tickets and walk in, but no more. Since Red Sox baseball tickets are $100+ for two people, lots of people are enjoying Triple A ball. I hope the rain stays away for just a little while. Have a great day & night. We had a great time with the week long Cribbage tournament. We played from early to late (well, not that late actually)....and had a great time at a lot of different picnic tables. Another view from the cabin. The view of the lake from our cabin was changing constantly. Loons on a misty cool day. A little Scotty dog I fell in love with. We had a great time on our vacation. We fished, cooked on the grill, took rides to Vermont to the cheese factory when it rained, and played lots and lots of cribbage! The weather was a little iffy at the beginning. We didn't have pouring down rain, but we had cool misty days in the 60s. I bought a new navy velour jacket that says Pittsburgh, NH on the front. It is very cuddly and warm and just what I needed for those first few days. The cabin had a nice heater, and was very homey and cute. On the rainier days, we did lots of reading and I really got into a book called Vicksburg 1863 by Winston Groom. It was a wonderful book and George also read it, so we discussed the Civil War a lot, and talked about George's two trips to Vicksburg. We caught three little fish and threw them back. 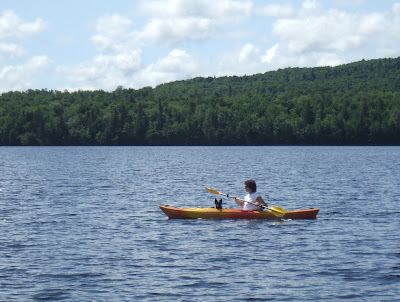 We seemed to be on a vacation from fishing as well, and just didn't work very hard at it. We didn't work very hard at anything, frankly, and had just a very nice relaxing week! Have a great day. Its good to be back. 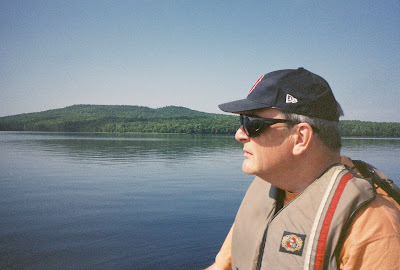 George, two years ago at the lake. 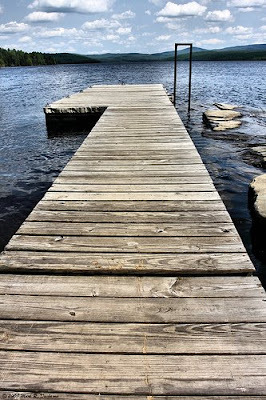 A dock on First Connecticut Lake. At last: Vacation time begins! Our vacation starts tonight. They tried to kill us with work at our respective offices today, but we managed to survive and get out at 4:30 to breathe a huge sigh of relief. We spend the first vacation day tomorrow packing for the trip, making chili, mowing the lawn and getting the house ready to be home to two kittens alone. Our plan is to leave very early on Saturday, the 4th of July, to try to beat some of the traffic fleeing the city. It is a shame, but we won't be in Colebrook, New Hampshire this year in time for the Boy Scouts wonderful pancake breakfast. We are very ready for this vacation. On our way home we stopped and got seven library books. The weather looks like it is going to be moderately crappy, so instead of only shorts and t-shirts, we are also packing rain jackets, jeans and sweatshirts. The low in the evening is going to be 50 something, and the high may be 70. There are going to be peeks of sunshine, but it looks like it will not be a full blown summer sunny hot week like last year. Lots of thunderstorms passing by, and a few clouds. We hope for a little sun. We actually don't mind. We are used to the changeable weather in the Northwoods, and it is fine to stay in the cabin and play Cribbage once in a while. Too much sun is bad for us, right? So, adios, see you soon, wish me luck, and let's give a high five to George and Yvonne when they catch the big one! George and I are really looking forward to have the 3rd of July off. It is a great new holiday! It gives us time to pack for our week trip to the cabin (see previous post) and to get the lawn mowed in between rain showers. The weather in the Northeast has been atrocious, and everyone is complaining about it. Dawn looks like dusk and the sun never shines. It is mostly rainy, with a few showers. It has everyone talking about canceled trips to the Cape and long days with their toddlers indoors. We are packing our rain coats and our good attitude. 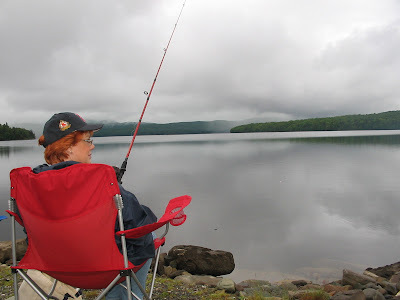 We are obsessive about checking Accuweather.com and Weather.com to see if there is any sun coming out for our week at the cabin. Weather.com is gloomy, and Accuweather.com is mostly cheerful with orange sun graphics, so we look at that site most often! Our zip code up there is 03592, in case you want to see our weather at the cabin. Anyway, vacation is coming, and we are very hopeful! Have a great 3rd of July!